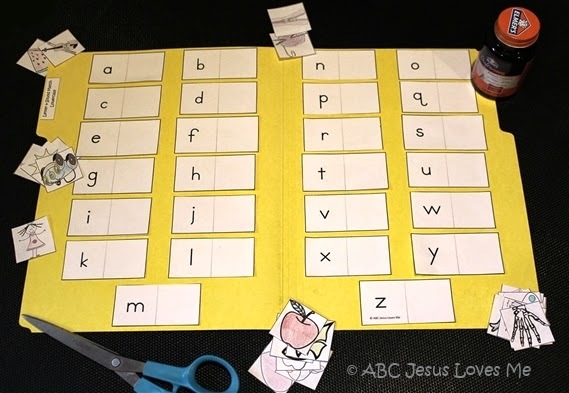 Before ABCJLM was even a thought in my mind, I created File Folder Games for Bubs. 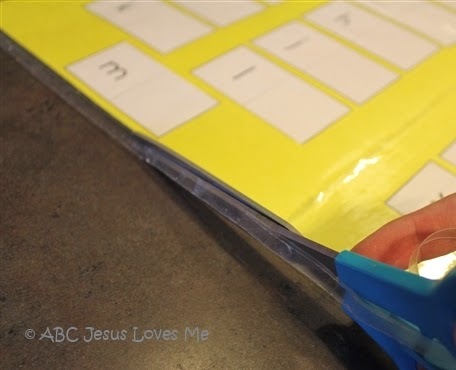 If you are not familiar with these, File Folder Games are inexpensive, easy to store activities that are great for teaching fundamental concepts to kiddos. The other day I pulled out some for Peanut and he really enjoyed them. 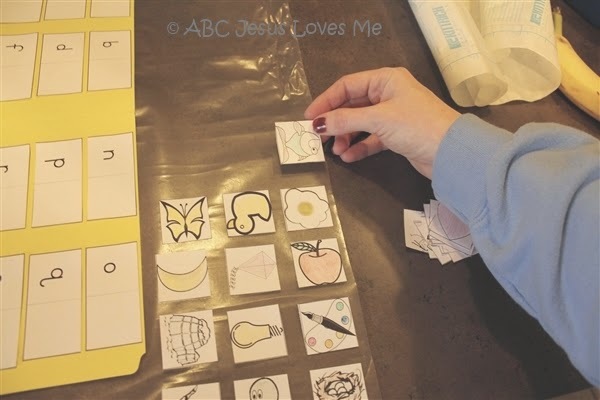 I presented the idea on Facebook to the ABCJLM family and the input was a resounding “Yes!” There was a huge desire for me to create File Folder Games for the ABCJLM website. 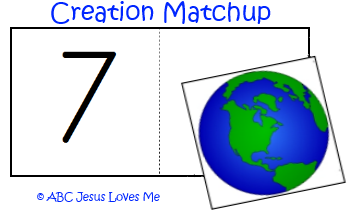 So far I have added four free color and black and white printables and I will be added more and more games as time allows. 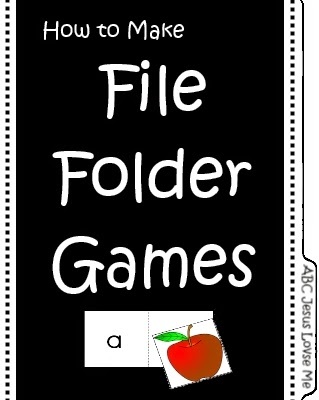 Click to check out our free File Folder Games. 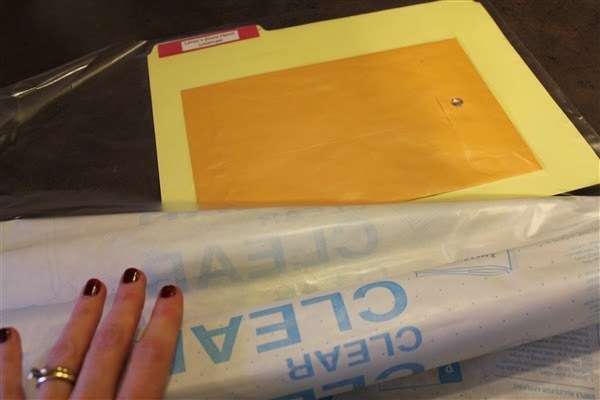 Today, I want to share with you how to put the games together on a file folder and how to laminate with contact paper for longevity if you choose. 1. 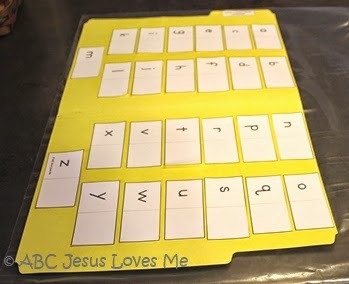 Print the File Folder Game from ABC Jesus Loves Me. 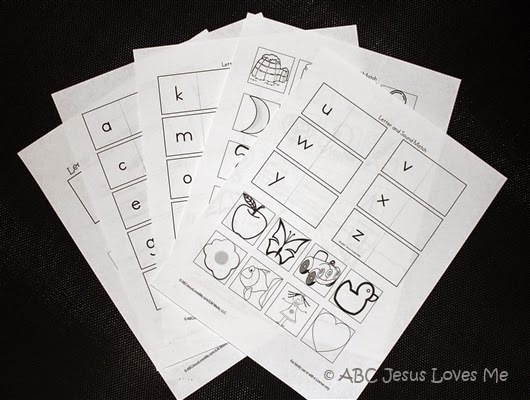 Each printable is available in color or black and white. If you are not going to laminate the game pieces, I encourage you to print them on cardstock. 2. If you choose to print in black and white, the images are created to be able to be colored with crayons, markers, or colored pencils. 3. 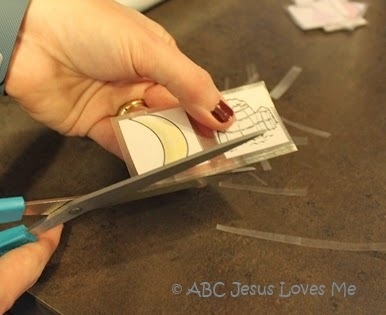 Cut out all pieces using scissors and/or a Paper Trimmer . 5. 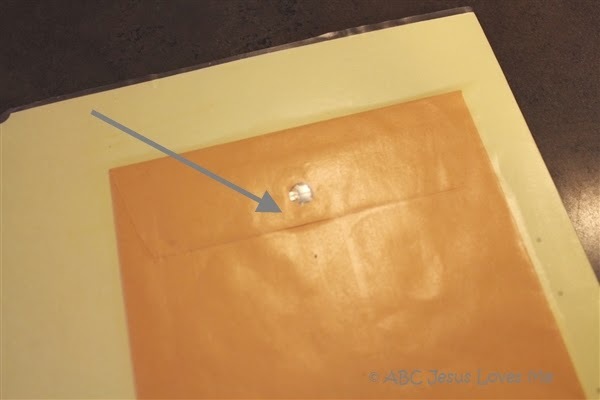 Glue an envelope to the back of the file folder. The clasp envelopes keep the pieces from falling out when in storage. 6. Glue the title image and directions box to the front of the file. Glue the title label on the tab. 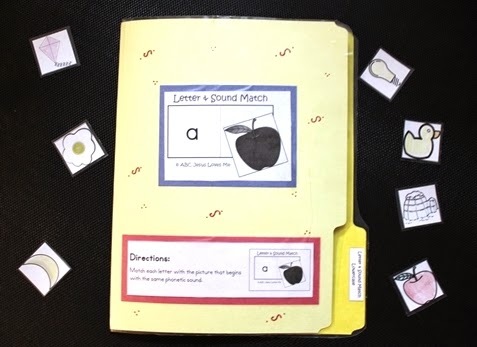 If you do not want to laminate your folder, you are finished. Great job! 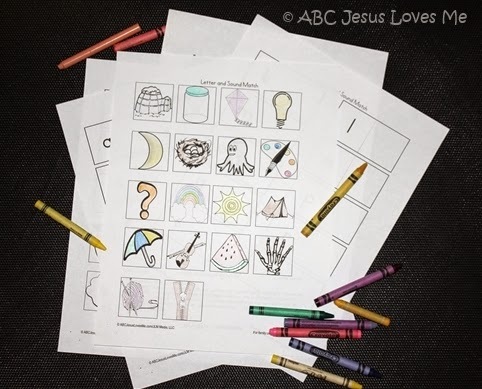 Use during quiet time, guided learning, traveling or whenever quiet activities are needed. If you desire the folder to last through several children or survive use of a toddler, I suggest that you laminate it. There are two choices to laminate the folder. 1) Use a laminator. 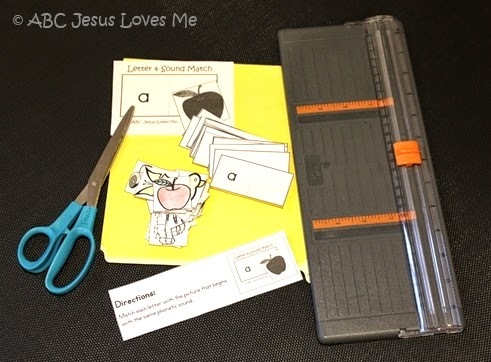 This is by far the easiest route, especially if you have a school supply store nearby or your library allows you to use a laminator. But this can be pretty expensive. There are also small laminators to purchase from Amazon. 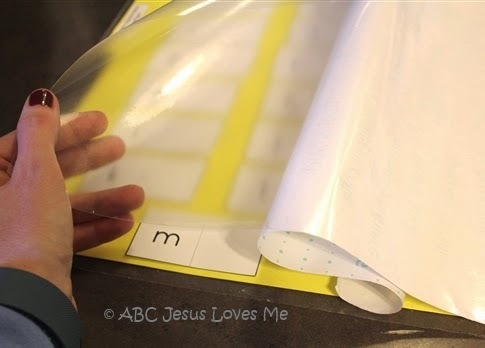 Many in the ABC Jesus Loves Me Facebook Group use the Scotts Laminator. I have not used it personally so can not attest to its abilities. Just be careful that your laminator is able to handle the size of a file folder. 2) Good ole Con-Tact Paper . This is what I use as it is substantially cheaper. A whole roll is only a few dollars. But, it is a little more work and can have errors. I will explain more in a few. It takes a little getting used to so I encourage you to begin with something you don’t care about as a practice round. 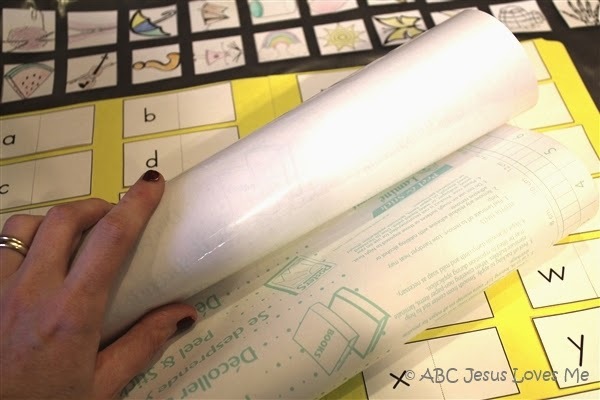 When you purchase contact paper, I encourage you to purchase one that has the guide lines on the paper as it makes it much easier to laminate a project with straight-edged contact paper. It can be found online or in most Target or Walmarts in the Kitchen section with shelf liners. I suggest purchasing the wider rolls as it leaves more room for error. 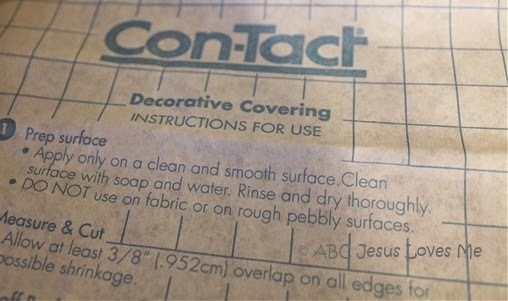 The contact paper has two layers: a clear, plastic side and the paper side which has directions and (hopefully) guide lines. The paper will be thrown away when finished. 1. I’ve found a large kitchen counter or table to be the best place to laminate a project. Make sure the surface is super clean and completely dry. 3. Next roll the contact paper the opposite direction so the clear plastic is on the outside and the paper directions are on the inside. This will make the next steps easier. 4. Oh…and bee sure to open and unclasp the envelope before laying contact paper on top. I will explain why later. 5. On a corner, separate the clear liner from the paper. Pull a couple of inches of paper away. Fold the paper underneath as pictured above. Do not take all the paper off or you will acquire a huge mess. 6. Very carefully lay a very small portion of the clear liner at the very top of the file. Make sure to get the paper straight. 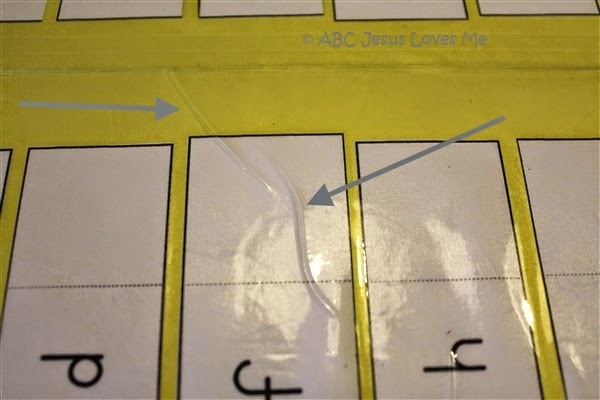 It is almost impossible to pull the contact paper up once stuck to a project. Smooth out the contact paper so that there are no air bubbles or creases. Doing too much at once will create air bubbles and creases. I promise. 7. 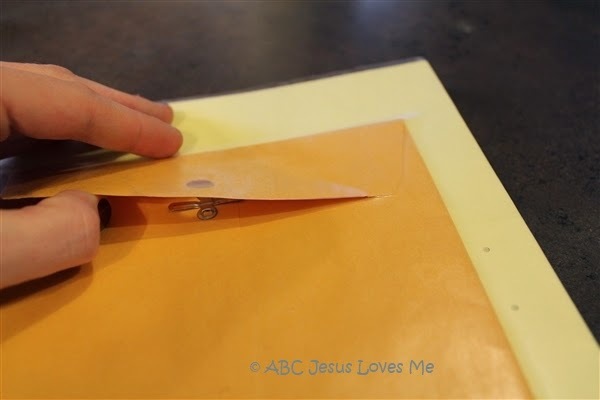 With your dominate hand, slowly pull the paper from the bottom away from the clear lining. The non-dominate hand will be on top to guide the contact paper and smooth out all bubbles and creases. The paper will then come off and can be trashed. 8. Turn over the lined project with the sticky side up. 9. Because I had extra wide contact paper, I was able to lay the game pieces on the side. Be sure to leave plenty of room between each to cut out the pieces. You will leave a border of contact paper around everything you cut. 11. There are times when despite my best efforts, creases happen (above image). In my early-mommy days, I would have been disgusted and started over. Four kids later and I realize it is very minor. Perfectionism isn’t worth a mommy being mad at the world and ignoring her children simply to be crafty. 12. Cut out the pieces leaving a small border of contact paper around each piece. Contact paper bounds best with itself. 13. Cut out the file folder. Again leave a border of contact paper. 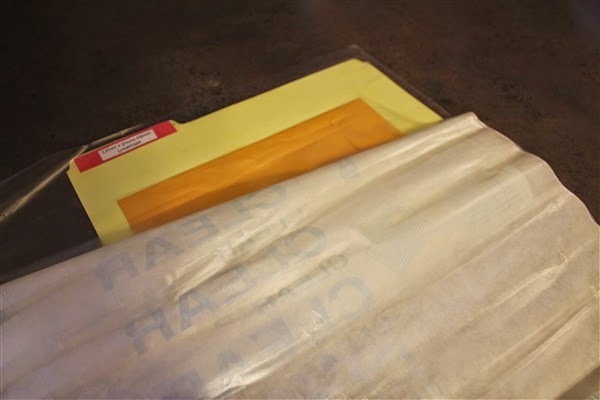 Did you notice that we contact papered the envelope shut? (Ooops) Just kidding! I knew this would happen. And we did it on purpose. 14. 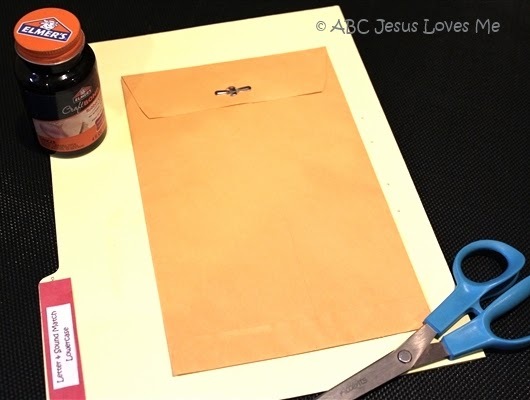 Taking your scissors, carefully create a shallow cut exactly following the closing of the envelope. 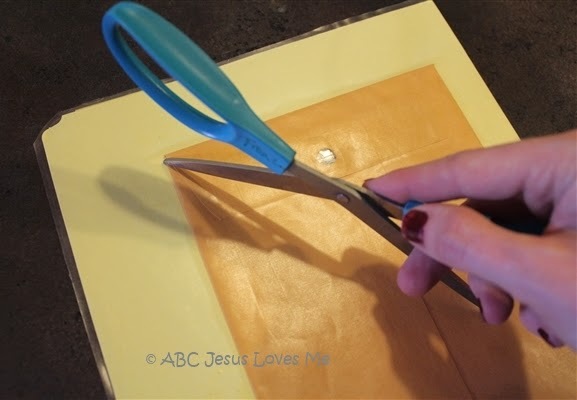 Be careful not to cut too deep or you will cut into the envelope. You simply want to cut the contact paper enabling you to open the envelop. 15. Gently open the envelop. 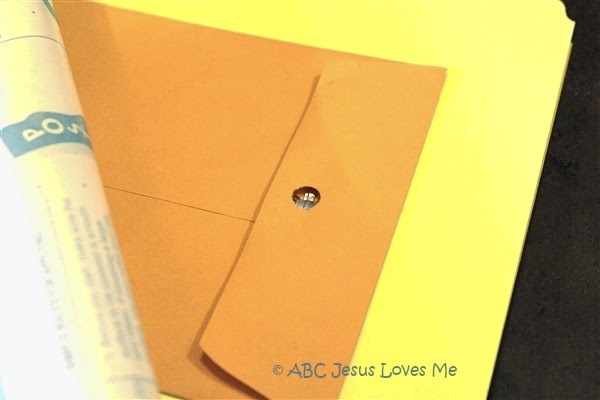 Because we laid the clasp under the envelope closing, it is simple to open the envelope. Gently cut the contact paper covering the hole of the closing. 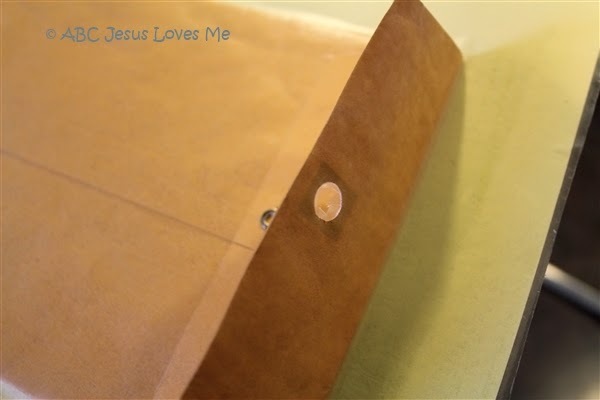 This will allow you to use the envelop with the clasp. 16. Place the game pieces in the envelop. And there you have it. 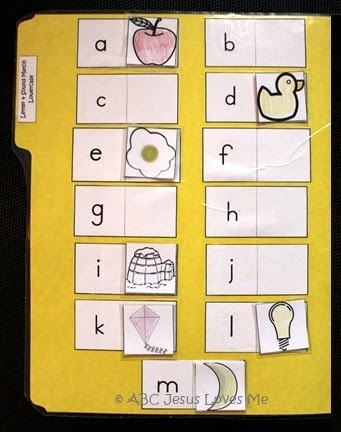 A completed file folder game! 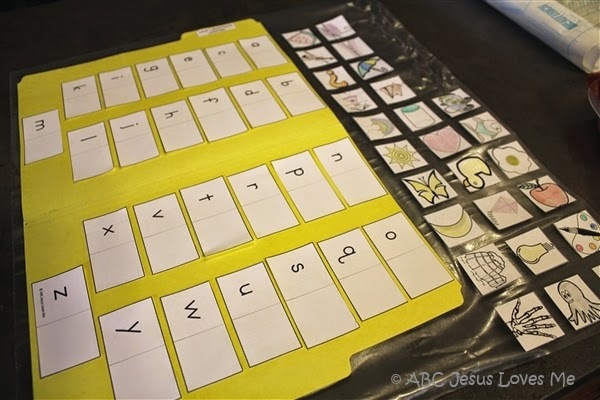 It’s ready for years of use during guided learning time, as a quiet activity, during play, or while traveling. 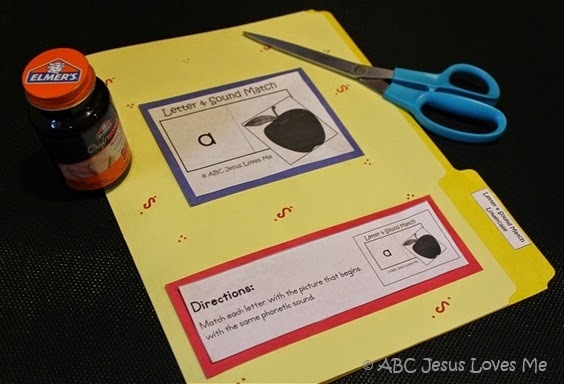 Check out these and all of the free ABCJLM File Folder Games! 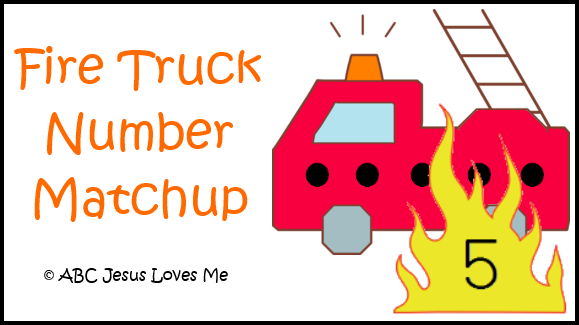 Right now, I am taking requests for File Folder Games and their themes. 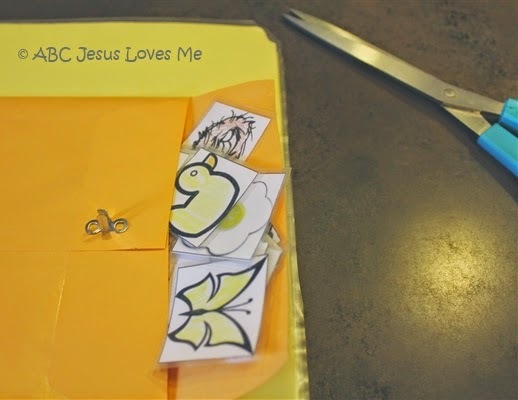 Be sure to put in your vote on the ABC Jesus Loves Me Facebook Group page. Previous Post: « What is Your Family Focusing on this Year?